Boss Phil Brown hopes his aggressive recruitment drive will continue the momentum built up by Lancaster City’s title triumph. 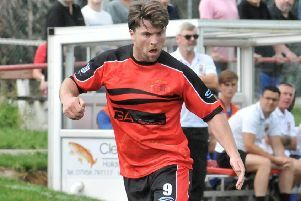 Colne striker Oliver Wood became the third new recruit at Giant Axe this week as the Dolly Blues prepare for life in the Evo-Stik Premier Division. Phil Brown welcomes Oliver Wood to Lancaster City. Brown had already brought Kendal Town midfielder Sam Bailey back to the club and snapped up Warrington winger Scott Harries. The City boss has also seen seven of his title-winning squad put pen to paper for next season after sealing the First Division North title. “The vast majority of the squad should be in place for pre-season,” Brown said. “It’s about building on the momentum of last season. “It’s not the usual, ‘come to pre-season and we’ll have a look’. “The lads there should be competing for a place come the start of the season. The manager believes it is more than just the club’s success that is attracting players. “Players are attracted to clubs that are doing well,” said Brown. “But even if a club is doing well and is on the up as I think we are, players talk to each other about what a club is like. “Whether the staffing is right, whether the changing room is right, whether it’s properly resourced. “Word of mouth has got a lot to do with it. Wood arrives on the back of scoring 20 goals last season as Colne missed out in the First Division North play-offs and will be tasked with filling some of the void left by Jordan Connerton’s move to Australia. The striker started the season with Kendal and has impressed both Brown and his players this season. “I tried to get him last pre-season but because Kendal had given him a chance he wanted to start the season with them,” said the City boss. “We kept an eye on things and spoke to people who had watched him. “I spoke to my defenders too when he played against us and he caused them problems. “I’ve met him and he’s hungry, honest and wants to improve. “On the pitch he’s mobile, athletic, strong, good in the air and can finish. “He has a habit of being in the right place at the right time. The other major vacancy in the squad is that left by Mike Hale’s departure, the goalkeeper electing not to move up to the Premier Division due to the increased travel commitments. “I’ve got a couple of irons in the fire,” said Brown. “I am working on it but it might take a couple of weeks because it’s an important decision. “I wouldn’t rule out an outfield player coming in too but that might be that.